This thread will show what this pakset looks like for those that have not been to the swedish board. 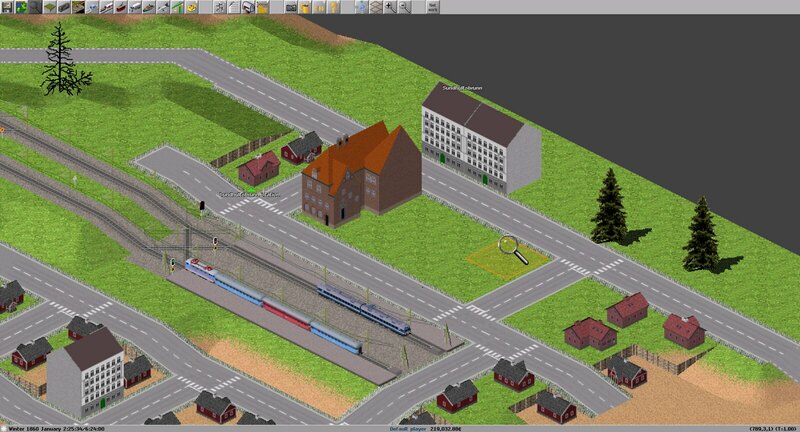 Currently it is a snapshot of previously showed screenshots, have not had time to make new screenshots just yet! How I imagine the forrest "factory" would produce threes. 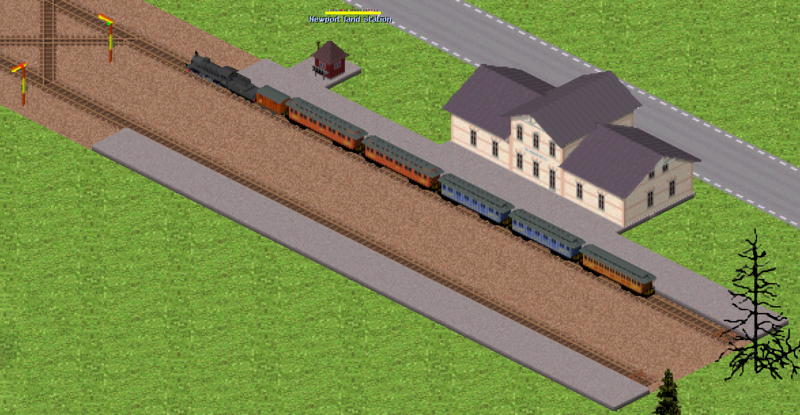 The house is the "factory" it self and all the brown tiles are coded as fields. The point being that they will occupy more tiles as the factory grows bigger. 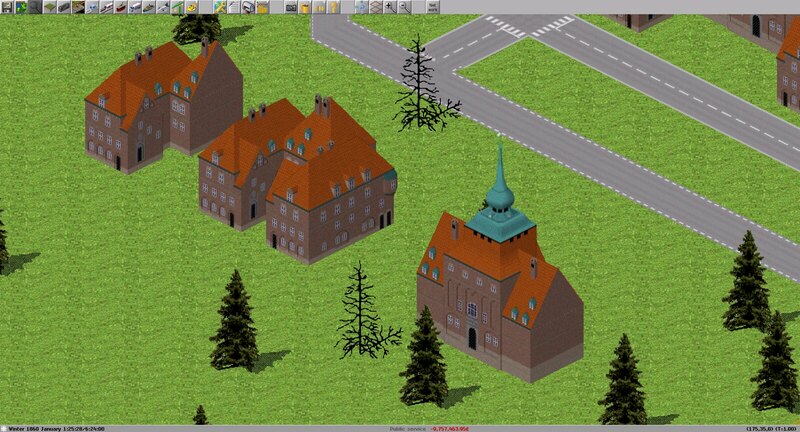 I have made these buildings out of 1 tile blocks, which has been put together in the dat-file. This has the advantage of beeing very flexible and modular, and the disadvantage that it is a pain to code the dat-file. I made some experiment with player colors on some of the Emu's. 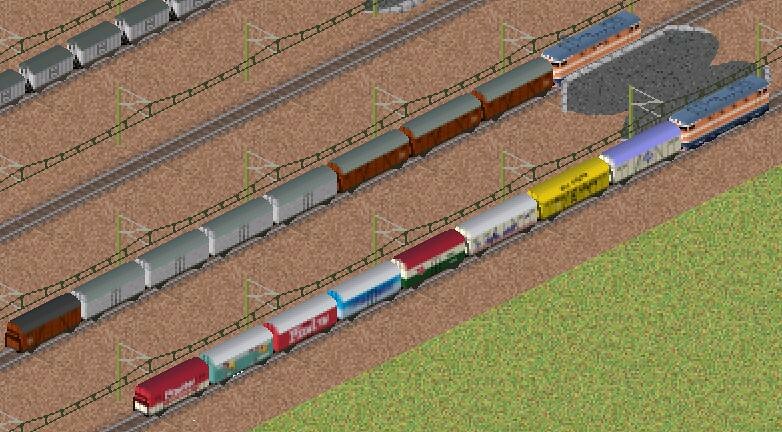 The lower most track features the actual paintscheme without player colors. Ending up this post with the freshest picture at the moment: Alpha blendings on the signals facing away. Also, you can see the placement of the Devel-new version signals. If you have any screenshot, dont hesitate to share! I see that we now have a Swedish pakset board - excellent! Unfortunately, however, the screenshots do not seem to work for me. I get grey hair from that picture issue. I just started using Imgur, but I read online that other people also are having issues with pictures not showing up. I will see what else is out there. edit: Out of interrest, can anybody else see the pictures? The screenshots are visible on Firefox (Android) and very pretty. I can see them if I copy and paste the URLs manually - perhaps you could provide a link as well as the embedded image so that those having problems can see them? If you want any of this, you can grab from the sources (they are linked somewhere in this forum) and compile your own versions to use with the British pakset, alternatively use the individual pak files from the already compiled pakset, existing on the server.exp.simutrans.com. Note that nothing is balanced and you would have to do some datfile editing. If this picture problem refuses to resolve, I will put a link under each picture as well. Strange it works for some and not for others! I have changed the server to the one Isaac provides, big thank you to you! 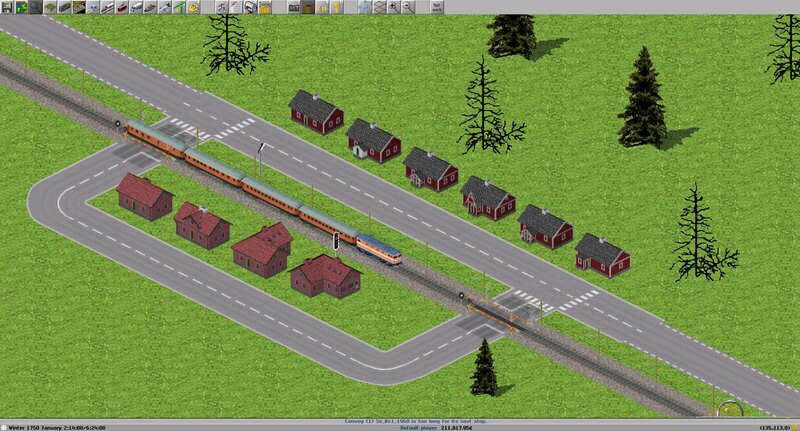 The commercial cars are the one on the right track and are modelled after real world cars. 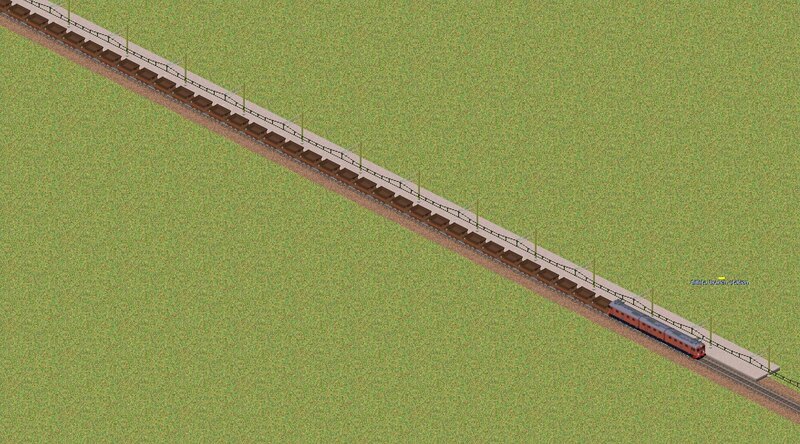 The train on the left track hold the same car in "unpainted" condition. 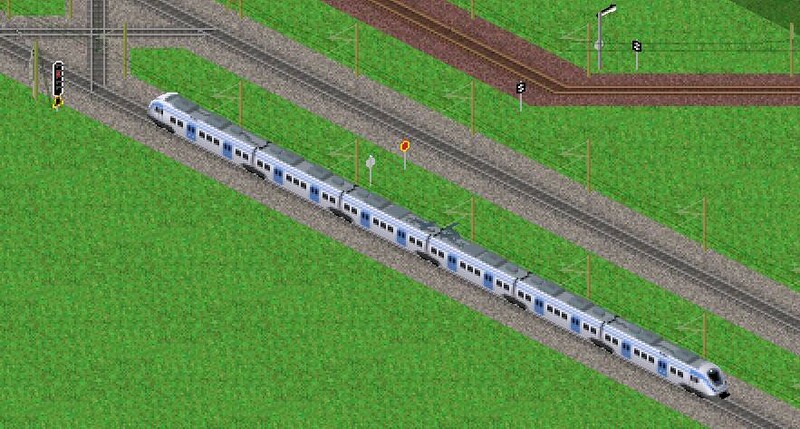 X60: In traffic from the year 2005 and a popular short range commuter train. 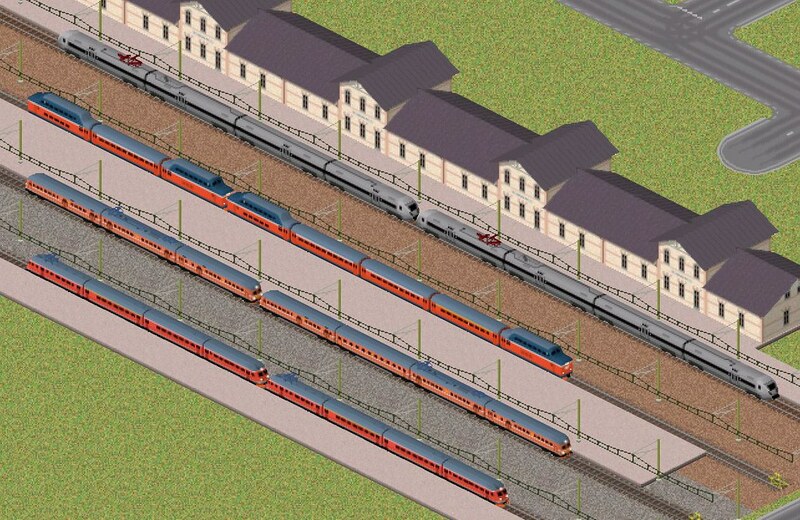 The train is configurable to have a minimum of 4 cars, to a maximum of 6 cars. Since there need to be some signal boxes around to house the crew that operates the old signals, some houses where needed. But the houses that resembles a signal box, looks in fact like normal houses normal people would live in, demanding some consideration of how to approach painting houses in general. I had painted some houses in the past, but I am not completely sure about them in terms of scale and style. The new houses are approx 18 meters pr tile, and I think it looks ok compared to the enviroment. The two L-shaped brick houses at the bottom is the same house, turned 90 degrees. What do you think of the scale, does it work? These are really nice. 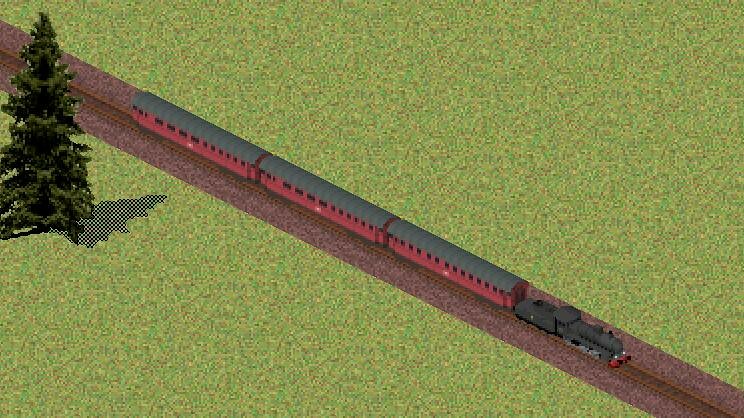 I don't remember what scale was decided for trains, anyway this looks OK. Might be worth trying one house in other scale to compare? 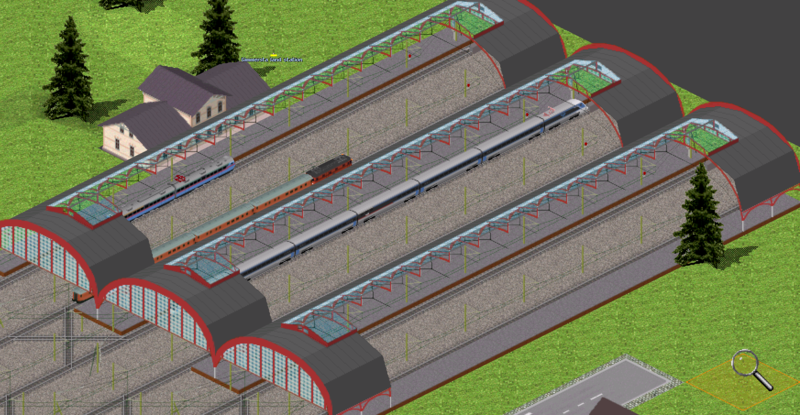 The trains are around 24 meter or tile, for comparison. Work is going slowly forward, its easy to take too much water over ones head! 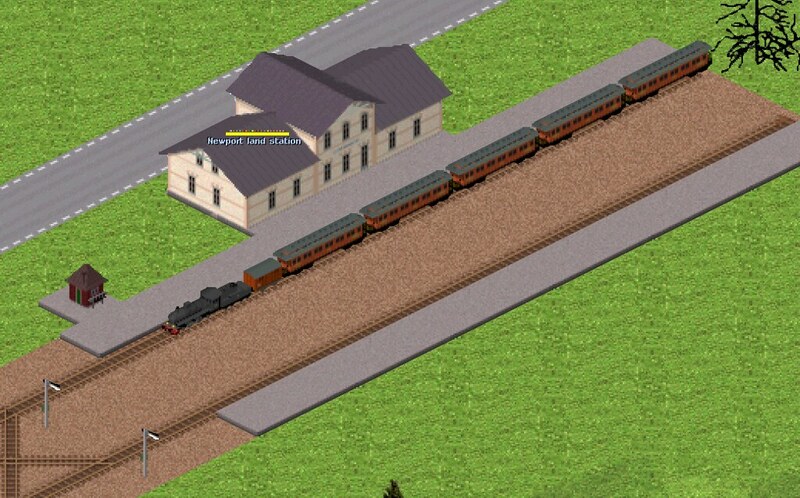 But, some new signal boxes are made, even featuring alphablending on the roof! These are all mechanical signal boxes. They might still get some details added, like ground patterns or other ground material so it doenst look so bare. The two lower ones are outdoor turning handles, only capable of handling mechanical semaphores. The two upper ones have indoor vertical handles, and can therefore support signals further away. 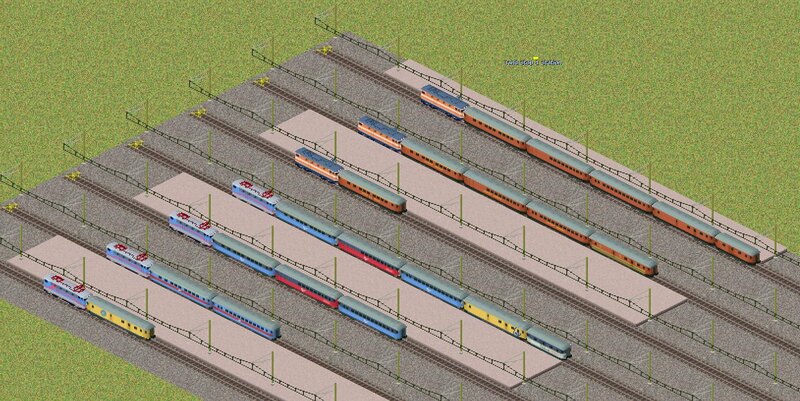 They are also able to support electricity to daylight signals, although no track circuit block is possible. Very nice. I really like the mechanical distant signal, with the big pulley at the bottom. 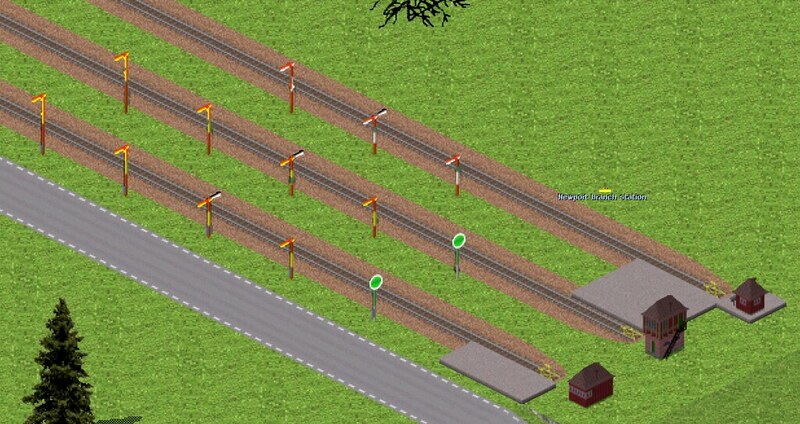 I would like to add some small details to more signals at some point! Incidentally, the red/yellow sign on the daylight absolute block signal has been made very much smaller, since it felt too wrong having such a big fictive sign being so visually demanding. Have no screenshot yet though. 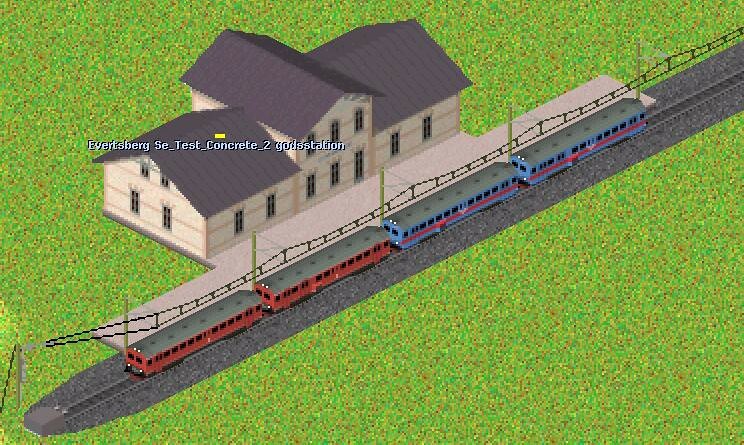 Since the previous server.exp.simutrans.com was closed down, I have also moved the pictures to a flickr acount. How lovely! Can you post a link to the Flickr account? It would be good to post a link to it on the Simutrans-Extended Facebook group. When you first get started doing these cars, its only a matter of changing the color and windows, and vupti, you have a new car! I think I got the colors more or less right. Will soon have to start programing the classes accordingly.. The last was quite a while ago, I take it you haven't had time to do any more work? The classes are still unimplemented. 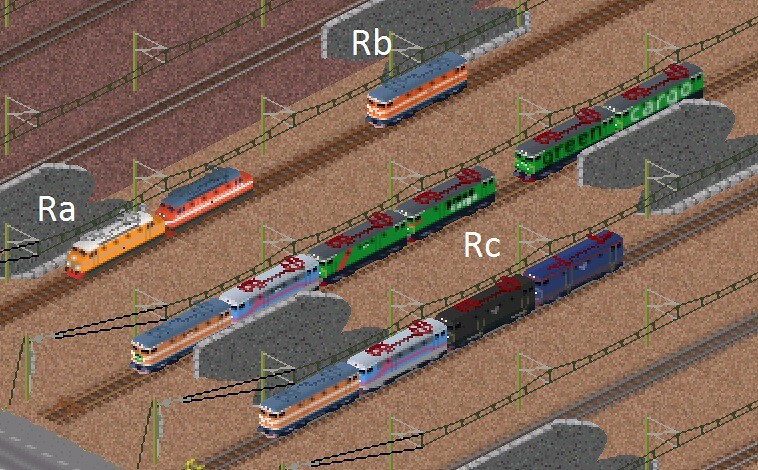 My main Simutrans time has gone into playing the online game and attempted to code some GUI-stuff for the new features, but I have painted some more of those cars and I believe to have found out that those cars where unfortunately not painted in those colorfull colors by SJ, but by other companies. The SJ ones seems to have been brownish all together of them. I experimented on my local computer to implement classes, and I was thinking what kind of classes should be included, and if they should share the naming convention of pak.britain or not, and if there should be the same amount. We definitely need three classes, as there where three different train classes, and question is if there should be a fourth and a fifth class like britain has it. I have hesitated to go code this into the pakset because I have not felt secure of what approach should be taken. I feel that this concept is something that should be decided upon before rather than after. Please add to the discussion on classes! There is a thread where some thoughts has been mentioned by me and others! I would love to hear yours. 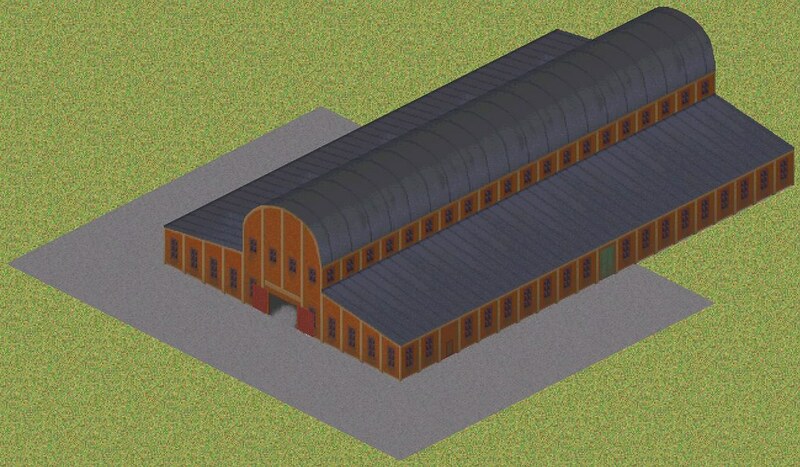 Im creating this building modular, so one will be able to put the pieces together in different ways and so make different buildings. You intend to use those like the 1870-1920 tenement blocks in Britain, where they are combinable into courtyard blocks? Yes that would be optimum if they can do just that. I just need to make sure when I paint the blocks that they fit together. The middle four blocks of this building, however, will be bound together, since there is a huge tower at the centre of it, which will have to be split into two halves. Good summer to all of you! I know some of the proportions are not right, I had to make some choices to make the building(s) fit inside the tiles. 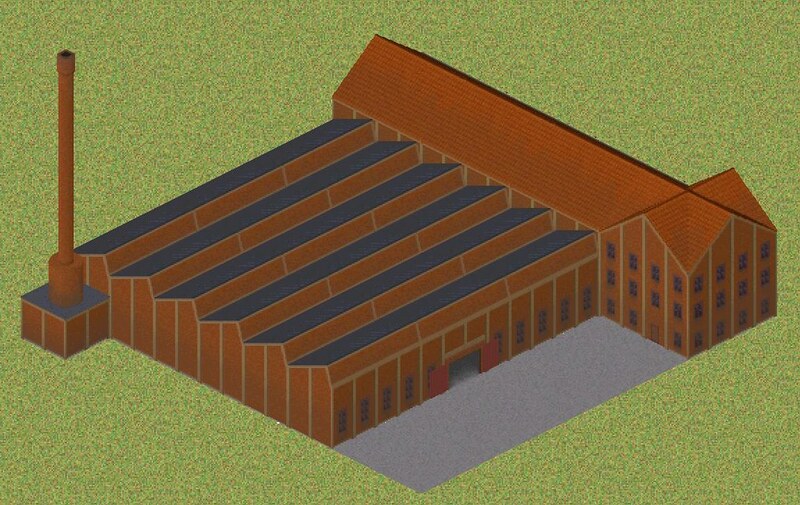 Already from the existing pieces, one can build different buildings, sort of.. Besides finishing all the tiles for the city hall (two tiles of stairs and walkways between the wings, along with all rotations) I will add some simple modules that can be used in conjunction with the existing pieces to add variation. Also adding some doors and windows to the faces that are currently solid walls. Is it possible to switch the cityhall in the standard game to have this instead? (Like one of those for bigger cities?) Anyone who knows? 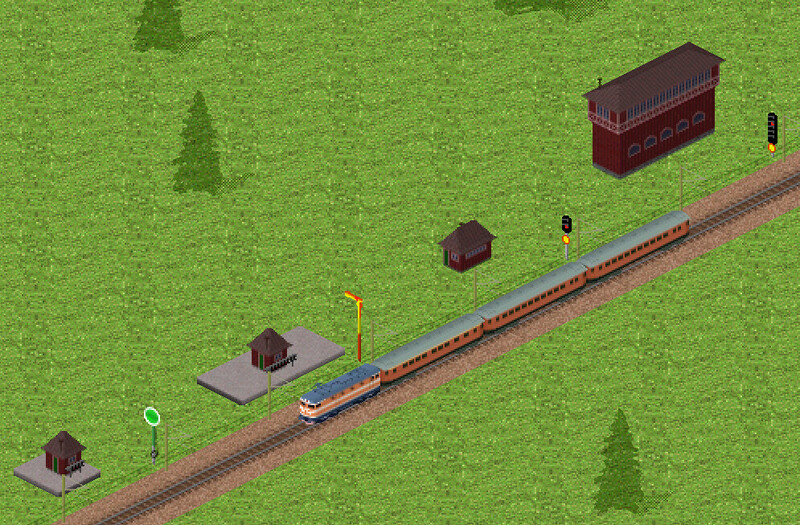 Btw, I'm back from holidays to start playing Simutrans again! Currently it exists not as a city hall, but as 6 different factories which is placed manually next to each other (for testing purposes). In order to properly make it a city hall, the datfile must be created. However, now it ONLY exists in this rotation. 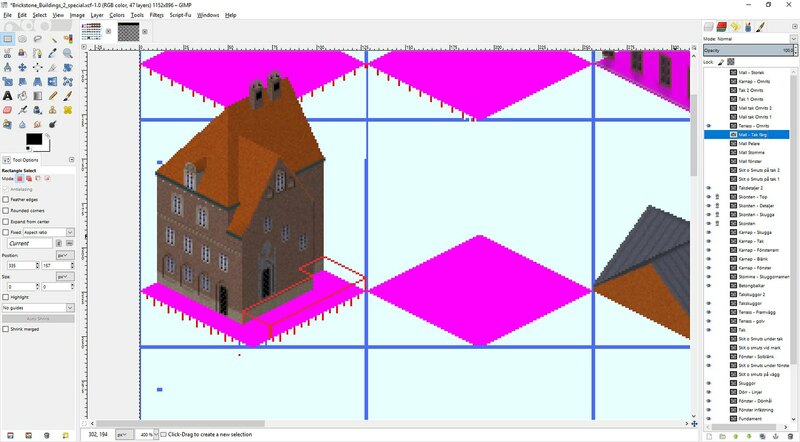 It’s pretty easy to rotate it to the other direction which would be needed to allow it to become an asymmetric building, it is “just” to mirror all individual buildings and apply the correct shadows for them. Nice! And very good work. If you're from Östersund you recognize it directly! 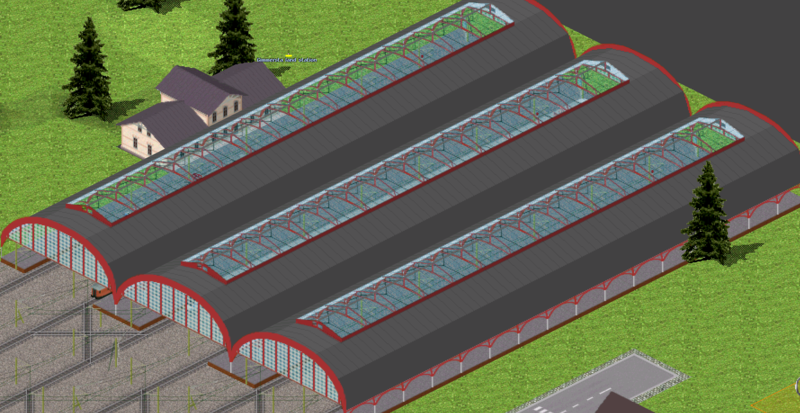 The other day I got inspired to do a proper platform, with big round roof and roof windows. The google link above goes to a picture search with lots of hits for Malmö Centralstation, a station which have these iconic arches above the platforms. While drawing, I first reallized that I could not make stops with more than 1 "height", and the structure is so big that it doesnt fit into one 128*128 square. 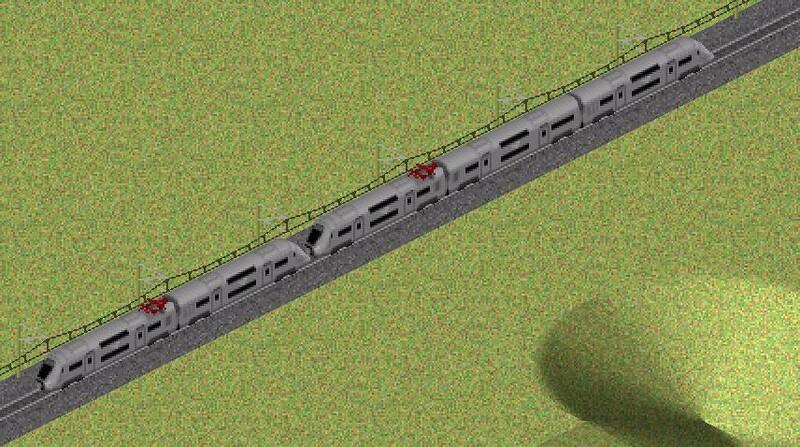 It was only a problem for the graphics with the platform on the lower side of the track, but I came around it by defining the topmost part "backimage", while the rest is "frontimage". 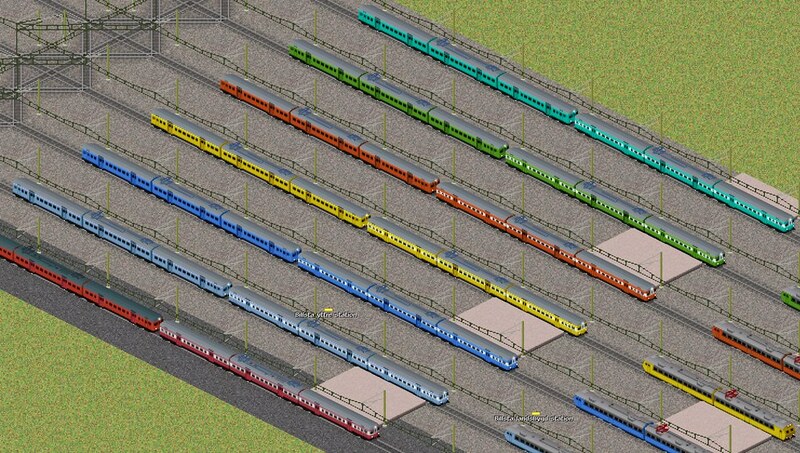 Although I think it looks surprisingly good, I think it would be a shame to hardcode the platform this way.. The end cap on the buildings will not be displayed. Unfortunately it wont be possible to paint the end cap on to each segment, as that would be visible through the roof windows. I would love a datfile parameter that forces the platform to use the end cap when it is in the end of similar platform, but that is probably not going to happen. I could make an extra platform object that always paints endcaps but that would clutter the toolbar too much I think. Any ideas?